InSSIDer for Windows XP - a product aimed at analyzing WiFi connections that a computer uses. 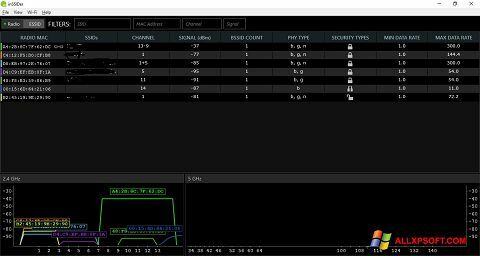 Helps monitor all access points on different modems. Provides convenient reports, it is possible to insert selected parameters there. May draw graphs indicating where most of the traffic is spent. Shows signal strength, location of connected devices. If a problem occurs, it can reveal the cause of the signal loss, and gives a number of recommendations for correcting the problem. It is possible to export data to Google applications. You can free download InSSIDer official latest version for Windows XP in English.